Faults (Rom. fallere = to fail). Normal and reverse faulted quartz vein Le Pulec. Faults are fractures in the rocks either side of which the rocks (fault blocks) have moved relative to one another. This causes an earthquake. The fractures are caused by tension or compression in the earth's crust produced by plates moving apart or colliding (orogenic forces), also by upward or downward pressure on the crust (epeirogenic forces). Faults may be localised or extend for kilometres horizontally and vertically and are described by the strike (direction) of the fracture, the angle of the fault plane (from the horizontal), and the amount and direction of throw (movement) along the fault plane. Normal Fault. This occurs when one block moves down relative to another due to tension in the crust (eg. during plate separation). This leaves a higher block bounded by a fault scarp, a type of cliff, which is the land form of the fault plane. Several of these with downthrows in the same direction are described as step-faulting, whereas adjacent ones with downthrows in opposite directions produce rift valleys (grabens) with block mountains (horsts) between them. Reverse or Thrust Fault. This occurs when one block moves up and over the other block due to compression in the crust (eg. during plate collision). This may produce a high angled reverse fault or a low angled thrust fault and has generally occurred during folding and mountain building. Tear Fault (Wrench, Transcurrent or Strike-slip). This occurs when one block moves sideways relative to another due to uneven compression or when the weakest resistance is at right angles horizontally. Movement may be clockwise (dextral) or anticlockwise (sinistral), sometimes called a right hand wrench or a left hand wrench. Another variety of transcurrent fault is described as 'transpressional', where there has been both strike-slip and oblique-slip movement due to compression. The outcrop patterns are curved because the fault planes are so shaped and this can lead to a 'flower structure' where several curved outcrops resemble a petal shape (see the Geological setting of NE Brittany map on the Brittany Connection page). Rey, P. F. 2014. School of Geosciences. The University of Sydney, Australia. In Jersey, there are examples of the three main types of fault. They also occur offshore, and recent, though infrequent, movements have caused earthquakes to affect the island. Their location and effect can be seen clearly on the map (Jersey. Channel Island Sheet 2. 1:25000, 1978) where outcrops have been displaced, eg. 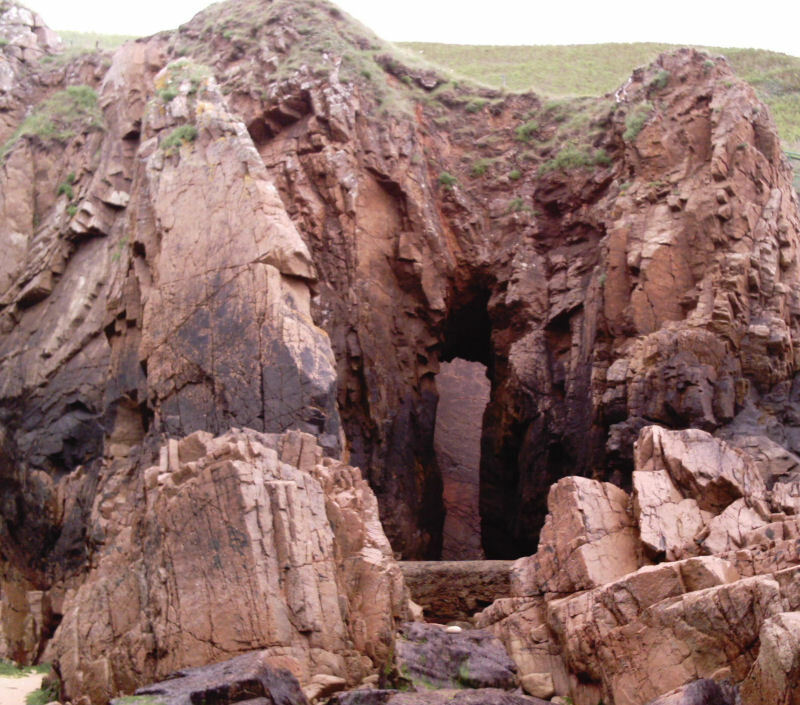 along the southern edge of the Northwest Igneous Complex, and of La Belle Hougue Complex on the north coast where the Frémont Fault is exposed. Elsewhere inland, boundaries between formations are covered by superficial deposits, so the displacement of the St. Saviour's Andesite and the Bouley Rhyolites is mostly inferred. The down-throw sides of the faults have not been marked but may be inferred by the repetition of rock units (or beds), or where older rocks are next to younger rocks either side of a fault, in which case the down-throw is on the side of the younger. 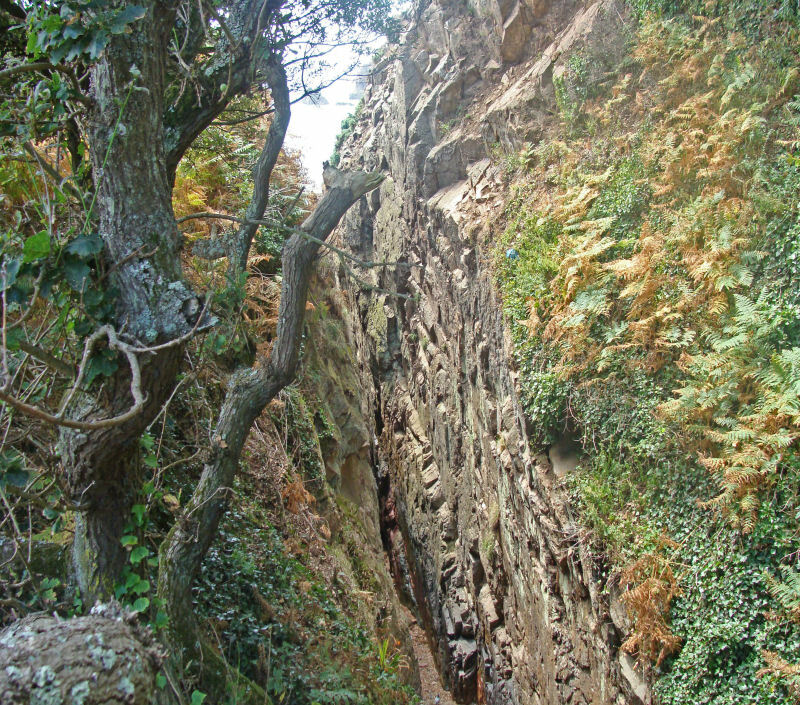 For example, small scale rifting is shown on the south-western boundary of the St. Saviour's Andesite with the Jersey Shale whereas step faulting to the east is shown along its northern boundary with the overlying St. John's Rhyolite Formation. 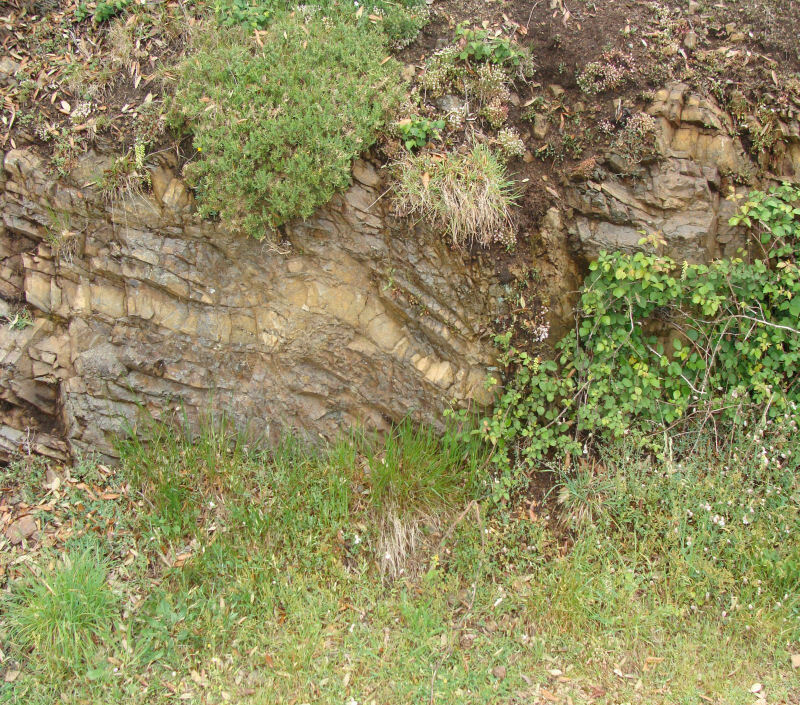 The effects of faulting can be seen in many outcrops on both small and large scales. In cliff faces, eg. spectacularly at Bouilly Port, the western side of St. Brelade's Bay and along the eastern path of Val de la Mare Reservoir it can be seen that normal faults have displaced sections of the Jersey Shale Formation and small scale faulting can be seen affecting the crest and flank of a minor fold. Tear fault plane & gorge, Bouilly Port. Normal faulting of fold, Le Val de la Mar. In the cliffs along the back of Plémont beach west of the steps, most of the large fractures are master joints (large fractures either side of which there has been no movement) but in the cove immediately to the east of the steps, faults can be identified by the weathered crush-zones or fault breccias along the fractures which indicate movement has occurred. Elsewhere, quartz patches and veining occur along the fault zone as on the south side of St. Aubin's Fort. Stack, arch, joints & faults, Plémont (east). Weathered fault breccia, Le Pulec slip. 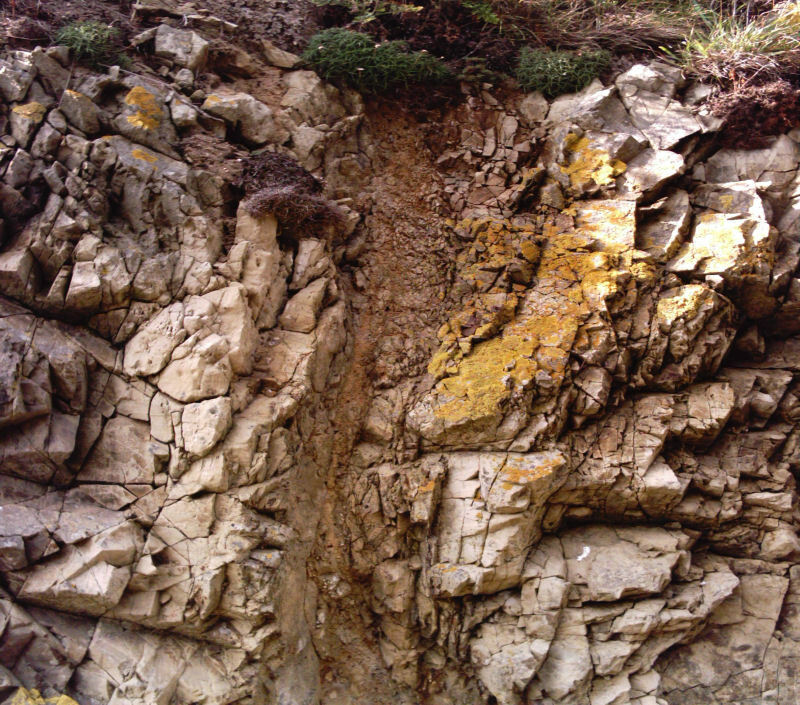 Quartz mineralisation in fault breccia, N-S fault in Jersey Shale, St. Aubin Fort (south). 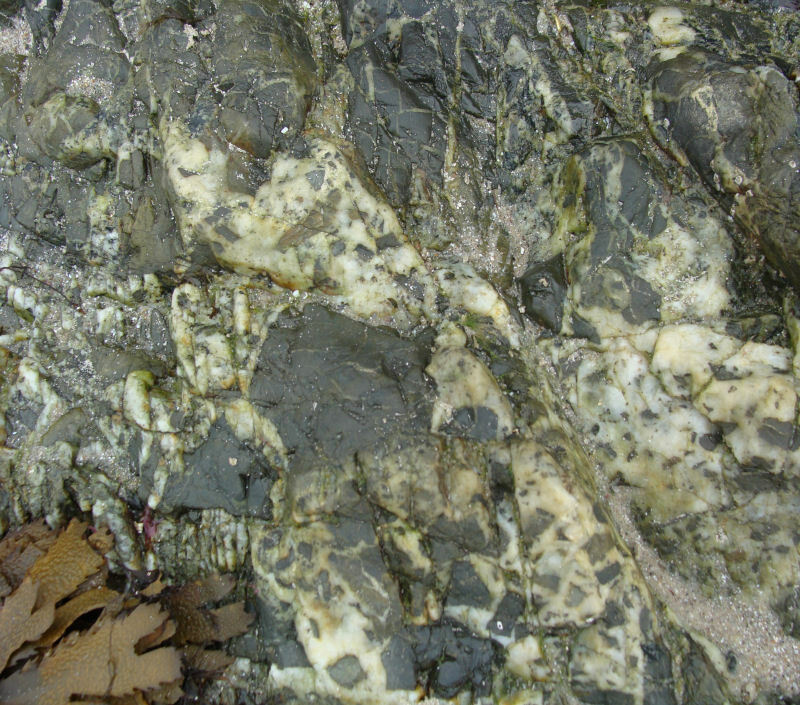 Other fault zones may contain mylonite, a granular, laminated and hardened fault zone rock caused by increased pressure and temperature ( largely dynamic metamorphism) during faulting, for example, in the faults affecting the hornblende, mica lamprophyres on South Hill, St. Helier. On the wave-cut platforms, the faults have been eroded to form gullies, the best examples being seen on the north west wave-cut platform, eg. La Bouque Fault south and west of L' Étacq, and Les Rouaux Fault on the narrow platform on the north coast, east of La Belle Hougue Point. Tear faults are most easily seen and identified where dykes have been displaced. As the dykes are nearly vertical to vertical then any displacement or offsetting sideways must have been by sideways movement. Both sinistral and dextral movements can be seen in the dykes between Le Hocq and Le Croc, and between St. Aubin and Belcroute (Nichols & Hill, 2004, p. 30) and offshore from St. Helier, displacing the axis of the St. Helier Syncline and the granite and diorite around Elizabeth Castle. The pattern of faulting is presented by Bishop & Bisson (1989, pp.75 - 81) after Helm (1984). Briefly, the authors record that major faults strike WNW - ESE, for example, La Bouque Fault and the Frémont Fault (L'Homme Mort Fault of Mourant, 1933) and are dextral tear faults. Elsewhere, the other faults strike between NE - SW and N - S and are normal faults which have down - faulted strata to the east. Of note are those along the southern closure of the Trinity Syncline, which appear superficially to be tear faults, but they displace beds dipping north to north - east and show the typical accommodation of strata by faulting around the closure of a plunging syncline, especially demonstrated by the small rifted areas. In contrast, the St. Saviour's Andesite has been down-faulted to the north east against the Jersey Shale by a NW - SE striking fault which in turn is cut by those just described. The faults are of different relative ages, determined from the dates of the rocks either side of the faults. For example, some faults pre-date the granite (Mont Mado), while others obviously post date the granites (eg. St. Peter's Valley) and others both pre-date (SW of Bonne Nuit Bay) and post-date the Rozel Conglomerate (from St. Catherine's Bay westwards). Yet others, post-date the dykes which also post-date the granites (south coast Jersey Main Dyke Swarm). This pattern clearly shows there were several periods of faulting. 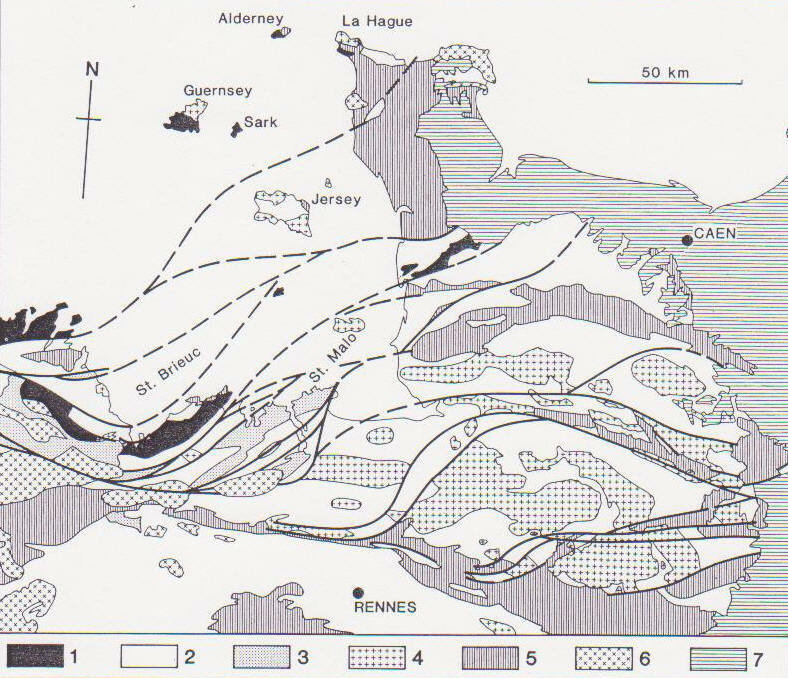 The faults with strikes varying about E - W have a similar strike to the dominant strike-slip faults in the region which affect Brittany and Normandy (Brown et al, 1990, p.182-3). The authors show we are in Northern Armorica where the deformation of our Jersey Shales (Brioverian) is of Cadomian age and separated from Central Armorica in Brittany by the North Armorican Shear Zone where the deformation is Variscan. They also show that we are between two off-shoots of the North Armorican Shear Zone where the strike is more ENE-WSW. The authors then go on to present their evidence and conclusions on the plate tectonic dynamics (Brown et al. loc. cit. pp. 207 - 8). It therefore seems that Jersey's fault pattern might have been produced firstly during the Cadomian Orogeny (Precambrian-Cambrian) then later during the Variscan (late Palaeozoic) orogeny. Again, posthumous control of later fault strikes by earlier ones could have influenced our pattern. No clear evidence exists for any possible effects of the Caledonian orogeny (mid - Palaeozoic). 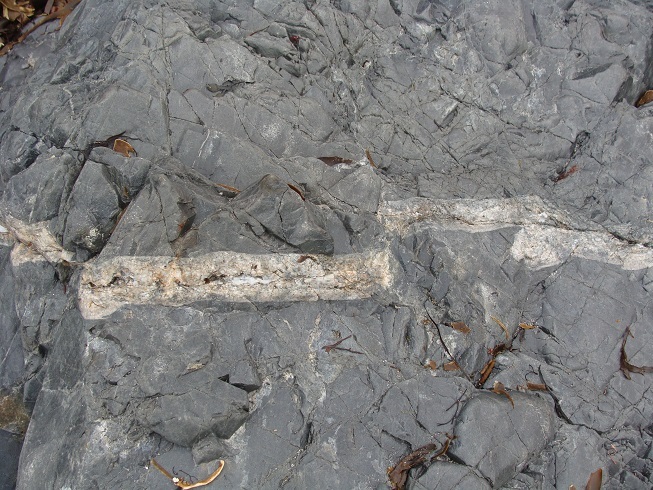 Joints are natural fractures in rocks which show no visible displacement of the rock masses on either side of the fracture. They occur as simple, or, more commonly as joint sets, groups of evenly spaced joints; if two sets interlock, they produce a joint system. Their strike, frequency and physical features can be mapped. They occur in all solid rock types to varying degrees and appearance, with varying dimensions and arrangements, and in different tectonic environments. The stresses producing them are not always obvious, but generally seem to have been produced by lateral movement at right angles to their planes, possibly due to relaxation of tectonic pressure, or by cooling in igneous rocks, for example, in granites and columnar-jointed flows. 1. 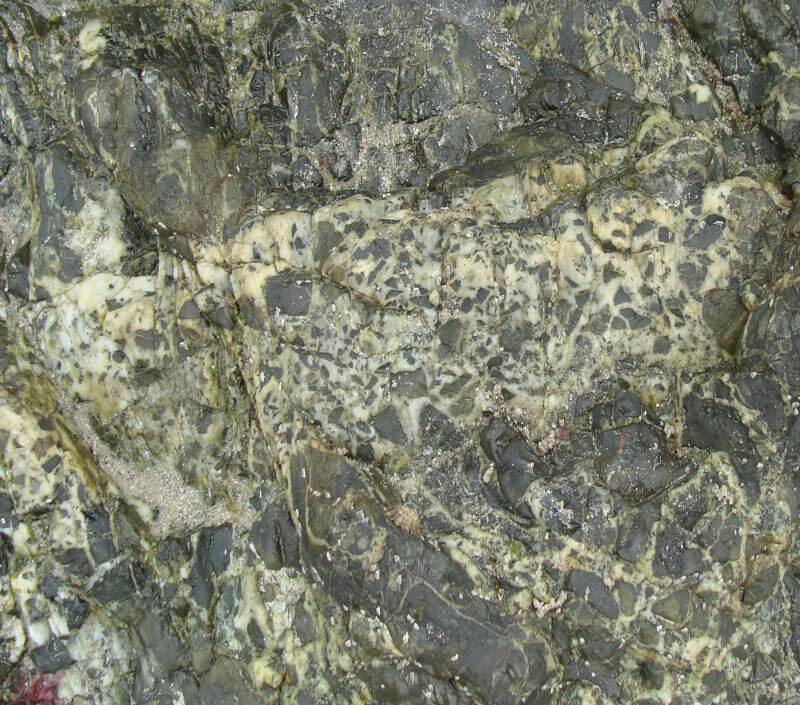 Early Cadomian foliated Plutonic complexes, eg. Icartian Gneisses. 2. Brioverian volcanics & sediments. 3. Belts of high grade gneisses and migmatites. 4. Late Cadomian post-tectonic plutonic complexes. 5. Lr. Pal. successions, in synclines along Cad. strike - slip shear belts. 6. Variscan plutonic complexes, generally granodiorite/granite. 7. Mesozoic platform sequences of the Paris Basin. 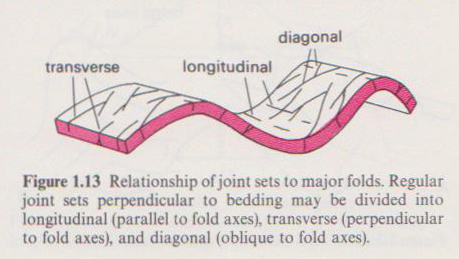 In orientation they may be 'longitudinal joints' (parallel to and fanning around fold axes); 'cross joints' (at right angles to fold axes); 'diagonal joints' (conjugate sets oblique to fold axes); 'strike joints' (parallel to the axial plane of the fold); and cross-strike joints (cutting across the axial plane. They may be filled with precipitated minerals and are called veins, or by magma and called dykes.